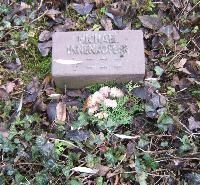 These pictures were taken in the mid afternoon of 29 November, 2005 at the municipal cemetery at Vaihingen an der Enz, a city near Stuttgart. 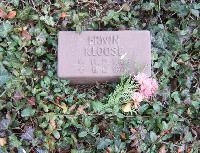 It is the same cemetery where holocaust victims from the local concentration camp are also buried. The military memorial is off to the left from the main entryway into the cemetery. 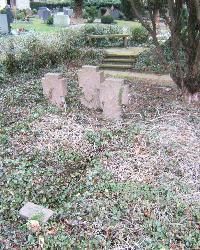 It consists of some graves surrounded by low hedges and, along the wall, a statue and plaques of names from both world wars. This cemetery is typical of post-1945 military cemeteries. 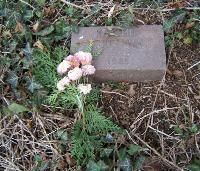 Groups of three crosses without names stand behind rows of simple brick-sized markers. Each stone marker has a name and dates of birth and death. Some dates are not known. 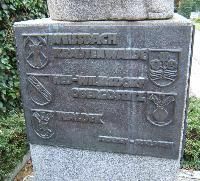 The centerpiece has recently been decorated with a wreath presented by the Vaihingen Volksbund deutsche Kriegsgräberfürsorge, the organization that has cared for German war graves since 1919. The soldier in the statue is naked, save for his steel helmut. This is not untypical for World War One monuments. 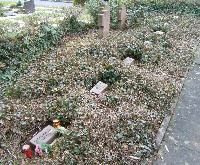 To the left, the plaques list the dead and missing from the First World War and the list for the Second World War begins. To the right, the names of the dead from the Second World War continue. Untypically, no dates or places are listed for either war, nor are any military units. Just the names. The memorial to the Germans who were exiled from Poland and Czechoslovakia in 1945 and who came to live in this area is located right next to the military memorial, visible in the background. 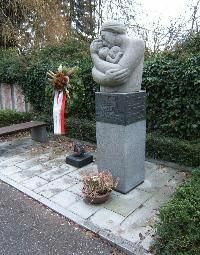 The wreath was put here recently (probably annually in November) by the Heimatbund Jauernig, the association of exiles from Jauernig. 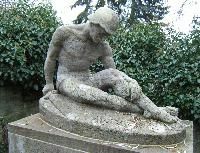 The memorial reads, Exiled by force from the land of their fathers / Liberated in death from grief, need and suffering / Only love which rejects hate shows the way of forgiveness. 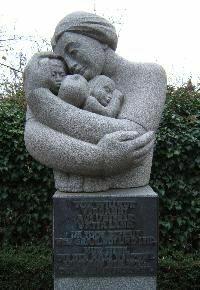 The memorial was created by Gerhard Bruhn-Dziecielski, Herwig Schubert and Ralf Möller. The sides of the memorial show the heraldic coats of arms and names of the places from which the victims were exiled in the Sudentenland (now in the Czech Republic) and Silesia (now part of Poland). This text at the base of the statue reads, Rock from the old homeland. Apparently, the memorial is made from material from the areas the victims were exiled from.